Let our team at Reliable Emergency Vehicles, Inc. supply your ambulance with all of the necessary medical equipment you will need. Below is a small sample of popular equipment available. If you do not see what you need, please call or send us your list and we will be glad to help you. 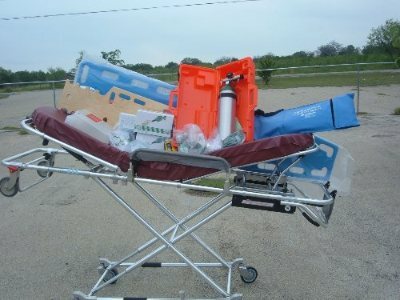 All of the start up equipment needed for a basic ambulance. If you have more items that you need, please contact us for a custom quote. This price is with a new Ferno roll in Cot. We have pre-owned cots availalbe which will greatly reduce your start up cost. Rescue Response Kit with Disposable Resuscitator for EMS squads, fire departments, and EMTs is one bag that is packed up and ready to use. It's filled to the brim with essential EMS products. Features: Spacious central compartment with 3 sections and 2 handy side pouches with hook and lop closures. Airway Management. Measures: 17" x 9" w x 7"
Be prepared for any burn emergency with the most versatile burn kit that offers different combinations of Burn Dressings and Fire Blankets for large or minor burns. Perfect for use in work vehicles or hanging on a wall. Unit Dimensions: 15.5in. x 3.5in. x 12.75in. Unit Weight: 7 lbs. As a Ferno dealer, we have a wide selection of cots and stretchers to meet your needs.